Town striker Danny Hylton should be fit enough to return to the squad for this weekend’s home clash against Blackpool. The 30-year-old, who has seven goals to his name this season, missed last Saturday’s 2-1 win at Bristol Rovers with a knee injury. However, speaking to the press this afternoon, boss Mick Harford said: “Danny’s back training, he trained today, so he’s fine. “He had a bit of inflammation around his knee, we’ve looked after him, given him a rest and he looks like he’ll be available for the weekend. “It looks like he got a knock on it and he went down, we don’t know the extent of it, but he’s recovered really quickly and we’re delighted with that. 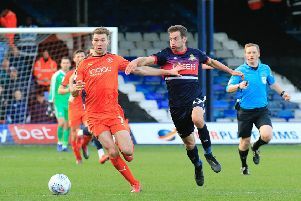 Hylton has scored in Luton’s last three home games, but whether he gets back into the side for the visit of the Tangerines ahead of leading marksman James Collins and Kazenga LuaLua is another matter. Harford continued: “It’s a really good decision to have and I’m pleased we’ve got it, in terms of all the players, in terms of the squad. “We’ve got six games left, you’re going to get niggles, we’ve got a couple of games over Easter which are going to be crucial and they come in a short space of time. On Luton’s other injury concerns, Harford added: “We’ve got one or two on the way back. "The long term ones with Glen and Pottsy (Dan Potts), they’re getting fitter and stronger, working hard in the gym, a fantastic attitude to try to get back to fitness.